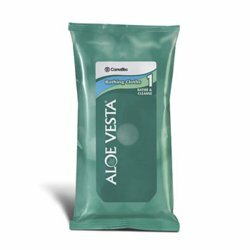 Convatec Aloe Vesta Bathing Cloths are a moisturizing cleansing system for no-rinse bed bathing. Each pack contains eight pre-moistened cloths for cleansing body areas. Aloe Vesta Bathing Cloths contain natural botanical oils which moisturize and condition the skin making it feel smooth and soft without leaving a sticky residue.